In the year 2000, the United Nations (UN) along with the world’s leading Development Institutions, decided that they would set Development Goals that they wanted to accomplish by the year 2015. Goals include everything from Universal Education to Combating HIV/AIDS. This page, however, will be focusing on Goal #1: Eradicating Extreme Hunger and Poverty. This goal is divided up into three categories: A) Halve, between 1990 and 2015, the proportion of people who have an income of less that $1 per day. 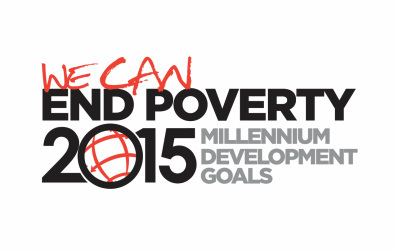 B) Achieve full and productive employment and decent work for all, including women and young people. C) Halve, between 1990 and 2015, the people who suffer from hunger. It is extremely important because about 25,000 people die everyday from hunger; mostly children. There is plenty of food in the world, but the problem is that the hungry people are trapped in extreme poverty. -870 million people do not have enough to eat — more than the populations of USA and the European Union combined. -98% of the world's undernourished people live in developing countries. -Two-thirds of the world's hungry live in just 7 countries: Bangladesh, China, the Democratic Republic of the Congo, Ethiopia, India, Indonesia and Pakistan. -Where is hunger the worst? - 1.4 billion people in developing countries live $1.25 a day or less. - Rural areas account for three out of every four people living on less than $1.25 a day. - 22, 000 children die each day due to conditions of poverty. - 1.7 billion people lack access to clean water. - 2.3 billion people suffer from water-borne diseases each year. - 12% of the worlds population uses 85% of its water, and none of the 12% lives in developing countries. - Also through buying fair trade products you will be participating in a sustainable trade system. - By spreading the word to everyone you know, it brings awareness to poverty and hunger.